The 1973 season started with the three main adversaries well matched. Chevron had introduced the latest evolution of the B19-B21 line, the B23, and Lola had refined the T290 into the T292. Osella had the closest thing to a new car with the very neat Abarth Osella PA1. Also, much was expected of the new March 73S with Vic Elford and Trivellato Racing both expected to field several entries. The well-established and highly-professional Red Rose Racing would lead Chevron's challenge and Lola were represented by Gérard Larrousse's Archambeaud Racing, another very professional outfit in Crowne Racing with driver Chris Craft and the quasi-works Barclays International Racing of Guy Edwards. Although the Red Rose Chevrons were first and second at the opening race, it was immediately apparent that the Lola was the quicker car and Chevron were forced into significant aerodynamic changes to the B23 to catch up. The Osella also required development but once Arturo Merzario got to grips with the works car, it was up with the quickest of the Lolas. The champion, however, was Chris Craft, whose T292 was powered by Cosworth's latest BDG engine. While others experimented with Chevrolet Vegas and Schnitzer BMWs, Craft stuck with the less glamorous option and won two races and finished second in two more. Guy Edwards'' experience was illustrative: he started from pole twice but retired all three times he used the Vega; with the BDG he was never on pole but won twice. Merzario had similar trouble with the Abarths, leading often but finishing rarely, while Larrousse also suffered engine problems with his Schnitzer BMWs. The Chevrons had less power from their Alan Smith FVCs but at least they finished more often than not and John Burton ended the season in second place. The March 73S was the biggest disappointment, being neither quick nor reliable. 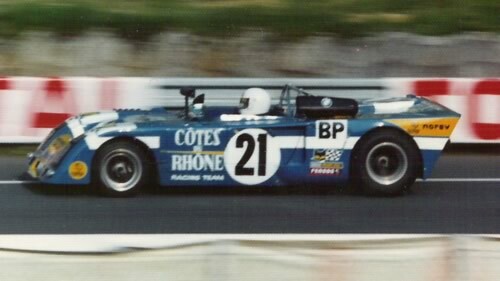 An Alpine A440 also appeared for Jean-Pierre Jabouille but did not have a chance to prove its potential. The hunt was on in 1973 for a successor to the Cosworth FVC, now reaching the limit of its development. Cosworth's own offering was the Chevrolet Vega, an all alloy engine, but development proved problematic. Abarth's own 4-cylinder engine was not looking so promising now Abarth had placed the whole project in the less enthusiastic hands of Enzo Osella, and the BMW engine, either from the works or from Schnitzer, were not the answer in sports car racing that they were in Formula 2. Brian Hart continued down the Ford route, building iron block BDA engines but also continuing his development of an alloy block version of the BDA. From his engine block experiments had emerged the 711M block which Ford used for the iron-block BDG. And it was the BDG, largely unwanted in F2, that emerged as the best sports car engine of 1973. The irony of it. Car histories will appear here as they are completed. Histories are being prepared on the Chevron B21, Chevron B23, Chevron B26, Chevron B31, Lola T210, Lola T212, Lola T290, Lola T292, Lola T294, Lola T296, March 74S, and March 75S. The main championship race results have been kindly provided by Martin Krejčí, and are very gratefully acknowledged. The assistance of www.racingsportscars.com is also greatly appreciated. To these have been added information drawn from contemporary publications Autosport , Motoring News , Sport Auto and Autosprint, from Christian Naviaux's excellent book on this subject "Championnat D'Europe des Sports-Protos 2 Litre 1970-1975" (Editions du Palmier, 2004, ISBN 2-914920-39-3), and from entry lists kindly provided by Richard Coe and others. Please get in touch if you have any additional details from these races. Chassis identification is largely from Lola, Chevron and March production records plus occasional mentions of chassis numbers in Autosport and Sport Auto . The chassis numbers in Javier del Arco de Izco's epic work "40 años de historia del automovilismo en el circuito de Montjuïc" (R.A.C.C., 2000, ISBN 8493172901) are believed to be the author's own observations and have also proved most useful.